Spring, sprang, sprung | Watts Up With That? Even the daffodils are confused, though in that article the writer cites weather, not climate. March 1, 2010 in Climate News, media. Yep, My Daffodils still haven’t breached the surface yet. In prior years they are out of the ground in mid-Feb.
Just a side note about temps in the DC area. Jan high temps averaged 6.3F below the seasonal average, high temps in February averaged an ‘unprecedented’ 12F BELOW the seasonal average. Looking at Accuweather through mid-March we’re going to be at least 5-7F below average. Since when did we need a warmist to tell us what spring is like? I sure don’t need one to tell me it is snowing. Yes it is difficult to cover the ground with snow and increase soil temps. I can tell you one thing, if “spring” has arrived early up north, then winter has arrived early down under too. I kid you not, it is cold here in Sydney, Australia tonight, 2 days into Autumn, and I think we had about 8 days of summer this year. Next sunday won´t be a spring day for sure. Which part of “average” don’t you understand? The springs in the UK gradually and erratically came progressively earlier from 1975 to 2000 or thereabouts and then stopped getting earlier. Since 2007 they have been coming progressively later. In the space of four seasons we are now already back to a spring which promises to be later than for many a year and possibly will not have an equivalent until one looks back to the late 70’s. The key is the predominating wind direction which is intimately connected to our latitudinal position relative to the mid latitude jet stream tracks. Those tracks would appear to be dictated by the balance between oceanic temperatures affecting the width of the tropics and the activity level of the sun affecting the strength of the temperature inversion in the stratosphere which affects the strngth of the Arctic Oscillation. 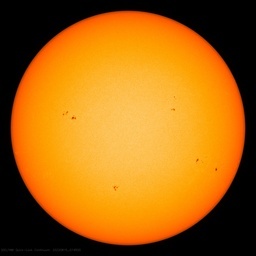 The more active the sun the weaker the AO and vice versa. I monitor spring in the SW of England by the start of mating activity of frogs in my pond. Last year they were a couple of weeks later than normal and this year they appeared last week, about a month later than normal. Late fall, early spring, cats and dogs living together… the world’s gone CRAZY! DUH… if it supports AGW it’s climate, if it doesn’t it’s weather, what’s not to understand? Now *some* people might think that’s a textbook case of confirmation bias, but *some* people also buy their gas from “big oil” and have homes powered by “big coal” so it’s safe to ignore their opinions. I can certify that daffodils are are ‘rarely’ confused. This is not their problem. When they sprout and bloom too early it’s the Sun what did it, and the absence of sufficient cloud cover. It’s always the Sun what did it! And I don’t care what Leif says what done it. Early springs could well be because of the increased amount of CO2 in the air, not warming. I actually saw some ground by the side of the road where the massive amounts of basic metal salts lowered the melting point enough that sublimation caused the seasonal ice cap to withdraw a few inches. We’ve had more than 70 days straight of more than 11″ of snow ground cover. You mean it’s going to get warm soon? It’s St. David’s Day today, the Welsh national saint’s day. We of the Cymru wear daffodils to celebrate – though I personally prefer the leek alternative, a symbol which you can eat and which, at need, can also be used as a weapon against the English (qv Shakespeare’s Henry V). The absence of the daffs is very noticeable and unusual, even here in extreme southern Britain (Sussex), though they are now starting to poke their greenery up a bit and should be out in a week or so I assume. A small matter forsooth, but how will farmers and agriculture fare as a result of this winter and the possibly non-barbecue summer? Is there anyone here who can enlighten me on this? Most obvious among the Warmists’ tactics, is the release of warming stories in spite of the reality around them. Hence we learn that 2009 was the warmest year on record, 1999-2009, the Warmest Decade In History, July 2009 the warmest July on record, and Spring now in early March. All of these assertions are patently false. All rely upon the perception of the reader that while they may be cold, that is a regional manifestation of AGW. This is puzzling – are we supposed to believe that one late spring somehow trumps 20 early ones (or whatever the figures are)? Snowdrops are only now coming into full flower, ditto crocuses. Daffodils are barely visible here; the odd flower bud is just starting to show. There was ice on the water trough around midday, despite the sun. This is in the Cotswolds. Louise is probably away in Fantasy Land. Late spring together with warmest global Jan temp, doesn’t make sense unless there are record temps in southern hemisphere or some is telling porkies. That’s funny. This week-end I was musing to the mate that we were certain to see a few articles on the delayed arrival of spring being due to global warming! I should have blogged on it. SPRING begins today, March 1, and, compared to its premature arrival over the past decade and a half, the natural world is awakening bang on time this year. As you point out, the evidence for AGW just keeps piling up. Well, weather depends on where you are, as well as climate. In Greece around Athens we have had a mild winter ( no ice in the water barrel in the country cottage) and spring seems to have come early, unless a cold March kicks in ( has happened before). We got winds from the Sahara, accompanied by the desert red dust.Not enough rain to wash it away well. Anemones bloomed in December ( not usual), almond trees are on course and even the pomegranate bush has started budding. Dandelions and rockets are blooming. Fortunately the other fruit trees, apricot and tangerine and lemon and olive have not budded yet. If a frost comes in March it will destroy the fruit. The pine trees have started their pollen though . This is good, if rains come in March it will flush it all away and we will not get the yellow stuff all over the place. Gionis, a night bird that winters in Egypt has come, so he is not expecting more cold. We have to see if the swallows come early. On the other hand our summer was cool, practically naturally air conditioned so I suppose the average temperature will be constant. True. I’ve seen one measly bunch of half open daffodils, the snowdrops are still the big thing in the UK and they are a month late. The blackthorn is not in bloom in the hedgerows, and it is still bloody cold. The north of England and Scotland had substantial snow last week. We have this popular TV programme called “Springwatch” and “Autumnwatch”. Not sure when this year’s Springwatch is about to start but one of the things they study is the phenological signs of first bumblebee, first ladybird (=ladybug) etc. across the UK. It will be interesting to see what data they collect this year. The 2010 website does not seem to be up and running yet. This essay is full of old, semi-scientific “news”! Table 1.8 “Changes in the timing of spring events” is particularly interesting reading. Well I don’t know about where he has been, but usually in Califonia, it is summertime by the time March comes around. The fruit trees usually all have done their blossom thing in Early february. Well not this year; there’s nothing greening or blossoming here in the south bay; I’m still raking leaves, and berries from the liquid amber tree on my front lawn. I don’t know what sort of trees they grow in heaven, But I can tell you that the streets of Hell, are lined with Liquid Amber trees. Also the streets of Sunnyvale. Another one of those; ” Hi I’m from the Government; and I’m here to help you !” projects. 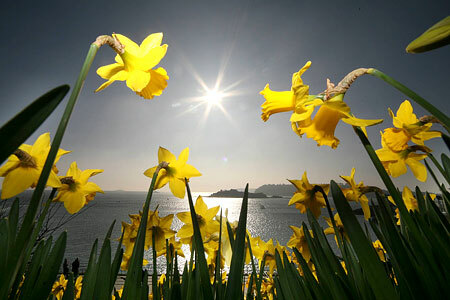 For US readers, St. David is the Welsh patron saint and daffodils are our national flower (and the leak). For several years as we all know spring has been early and March 1st ,St David’s day, has been full of daffodils- not this year, only green shoots visible. PS another great post from W.E. I’ve never seen any archeaologist not claiming that Neolithic henge monuments were developed so that early farmers knew when to plant their crops. It’s always seemed more likely, to me at least, that they knew enough to plant their barley when the hawthorn [may]) blossom was out (or whatever). Here in Leicestershire there is a old saying “ne’re cast a clout [item of clothing] til may is out”. I guess this originally referred to the above blossom, but is is now thought to refer to the month of May. At what temp does sping start?. Ah, yes, April is the cruelest month. Louise Gray typifies the eviron-mentalists. No matter what ridiculous prediction they make and are found wanting, it does not deter or embarass them, they just butter up again with another idiotic statement or repeat the one that just failed. The increase of Antarctic sea ice is blamed on the Ozone Hole. However it is said the Ozone Hole is shrinking. The Ozone Hole graphs end in 2005. 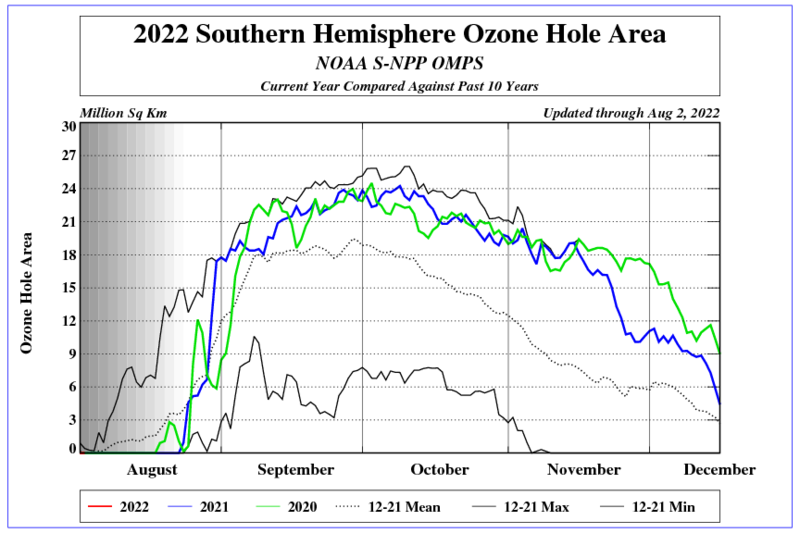 Someone needs to make a graph going back in time as far as possible, showing the extent of the Ozone Hole and the extent of the Antarctic sea ice together to see if there is a relationship between the two as claimed. Will someone here please plot this graph? I am not a scientist but I am seeking the truth in all these conflicting claims and these graphs are the most convincing. As a soccer player and coach, it has become painfully clear in recent years that spring is coming later and later – with many games snowed out, and pleasant spring weather nearly non-existent. The same problem in the autumn with winter arriving earlier. baseball playoff game was canceled on saturday and then played last night in below freezing weather). The truth is actually simpler. There never was a “fear button”, the alarmists only thought there was. They have been absurdly banging a big red button which is not even connected. The reason is this. The public have little fear of natural events, and even less fear of hypothetical possible futures that might happen after they’ve died, any more than people fret over the much more frightening picture of old Sol becoming a red giant. The “fear button” is perhaps more accurately a “guilt button.” And that’s all there ever was. Although people won’t be aroused to fear, they are much more easily aroused to guilt. However, after the disgraceful emotional blackmail tactics used by developing nations at Copenhagen, I would say the guilt trip has run its course. White, M.A., K.M. de Beurs, K. Didan, D.W. Inouye, A.D. Richardson, O.P. Jensen, J. O’Keefe, G. Zhang, R.R. Nemani, W.J.D. van Leeuwen, J.F. Brown, A. de Wit, M. Schaepman, X. Lin, M. Dettinger, A. Bailey, J. Kimball, M.D. Schwartz, D.D. Baldocchi, J.T. Lee, W.K. Lauenroth. Intercomparison, interpretation, and assessment of spring phenology in North America estimated from remote sensing for 1982 to 2006. Global Change Biology (in press). We found no evidence for time trends in spring arrival from ground- or model-based data; using an ensemble estimate from two methods that were more closely related to ground observations than other methods, SOS trends could be detected for only 12% of North America and were divided between trends towards both earlier and later spring. Phil Jones is currently being interrogated by MPs about his role in the Climategate Scandal. Unbelievably the first I heard about it was on the BBC. Graham Stringer MP (Manchester) was giving him a right grilling and Jones looked very ill and sickened by his role in the scandal IMO. I dread to think what his mental state is after he has been exposed as committing 20+ years of non-science. This sad story in the Daily Mail (UK) is very disturbing and shows how much the warming charlatans need to answer for. Temps 3-6 degrees below average (44F on 3/11) forecast for Cleveland through the next 10 days. I’ve got daffs breaking soil nearly yearlong – sometimes under 2′ of snow, for weeks! They’ve done that for at least 40 years. You see, once they get warmed by the sun on any day they poke up and then just try to get them to dive back under! Oh, and it might snow here in May, too. In those years I suppose, just to be an alarmist, I should really fret over Global Warming. We had one daffodil open yesterday, Sunday 28 February, here in Milford Haven. Today has been warm, +9C, sunny and no wind. The local global cooling fan has not turned all day. I guess Spring has arrived. But hey, if the warmistas are right you’ll soon be raising grapes as far north as York. Repeat a LIE, loud enough…long enough…eventually most people will believe it is the truth. If Spring keeps coming 11 days early, in about 33 years time it will be right back on schedule. However I think Spring is tricky, like Easter which is always early, or late, but never on time. If Spring is arriving early, is it finishing early, or on time? If the former, are the other seasons moving up and may we look forward to Summer at Christmas? How will this affect my birthday – will that start coming early too? “So many questions; so little time,” said the March Hare. What do you mean a cold snap, it is a bloody cold long winter here in the UK. We’ve had snapdragons bloom year round here in the high deserts of CA. One baby daffodil sprouted last week. Nothing out of the ordinary for flowers. I will note that we’re JUST now seeing trees start to bud. Kinda late for this area by a few weeks. It has been warm this winter here in Portland Oregon thanks to El Nino. Our daffodils have been blooming for the past two weeks. I can’t say the same for our family members in Minnesota! I’d wager the reports of earlier spring come from urban/suburban areas. A good measure of UHI effects, which indeed could lengthen growing seasons by weeks. Indication of anything other than local UHI effects, tho, it is not. OMG, if [cue sinister music] Global Warming is happening, then winters will be shorter and milder!!!! It would be The End of Life As We Know It!!! An Ideologues spring time. Where is the chart, map or graphic that tells us when the ideologues have us expect spring? When do daffodils bloom in utopia? I asked at one point in time if Dallas had snow in utopia on climate progress and it was one of many thousands of deleted questions. Today, I decided there was little enough snow at home (near Concord NH) to declare the end to the main snow coverage streak. A couple years ago that didn’t happen until April, but that was an amazing snow year. At this rate…. The snow was heavy enough so my dog could walk on it and the pile by the yurt was so deep my dog nearly climbed onto the roof over the fire wood. A 40 mile (65 km) difference, but the real effect is the 1000+’ (300 m) gain in altitude. Oftentimes it’s the storm track going by New England that determines if we have a snowy, rainy, or dry winter. This year with the southerly storm track, some of the storm that hit us start south, miss us to the south and east, but wrap warm around and come at us from the north. My impression of the Jones thing was of policymakers who’ve realized they’ve been betrayed. Jones and UEA’s chief officer said some disgraceful things. Not having Welsh daffodils flowering on St David’s Day is a serious issue here in Wales! The farm who supplies them near where I live has hardly any daffs out – its a field of green, not bright yellow. Daffs stop growing when the temperature falls below 6 C.
Well, I could have told him that: the daffs are only about 5 inches above ground, with a hint of flower buds, where, in the exact same place, a year ago, they were flowering punctually on March 1st. Two and three years ago, they’d already been at it for two weeks. But hey – any self-respecting daffodil would be very circumspect in regard to putting out flowers after the deep freeze we’ve been having. Early spring, the best powder falls come to the Northern Sierra. Saturday was just such a day with a good foot of fluffy softness on the ski runs. There are hints of more snow coming Tuesday and Wednesday. Come on, El Nino do your thing! The best of skiing lasts deep into April even after the lifts close, due to lack of crowds. It’ll be time to switch to skins and let the climbing begin. So the warmists are saying the Weather is too cold because of Global Warming. That must mean that in the 70’s, the Weather was too hot because of Global Cooling. Somebody forgot to tell them that the bulb on the thermomoter goes on the bottom. Idols, journalists, and members of the royal family will again travel to Spitsbergen, and spend an hour or two looking at melting ice. They will travel by jet and helicopters, and the magic moment will be covered by TV and media. “Snap” is the only word the BBC weather presenters are allowed to use next to cold – still hoping people wont notice the cooling climate. When the cold snaps get long enough, they’ll be talking about the impending “ice snap”. Living in the “non plus ultra” NW area of the Netherlands (roughly 53N. 5E), between tulip- and daffodil ackers, there is still nothing to see from any growing activity. Forget about global warming as a prod for funding; a few cooling years and the whole incentive for funding disappears. But cycles — now there’s an event that keeps on giving. ENSO changes, PDO or AO oscillations, solar changes, the list goes on. Tell the politicians that you need the funding to learn when there will be 7 years of famine or years of plenty, 20 years of increased snow removal budgets or 20 years when they can divert such mundane monies to pet projects. And since there are so many cycles as well as cycles within longer cycles, the need for funding will be open-ended, unlike Al Gore’s dead-end belief system. As for when Spring will be sprung … I’m not even going to consider that problem for another month. I’m expecting another inch or two of gobal warming over the next couple days to freshen the covering we’ve had this year since, it seems, forever. Doesn’t one of the Milankovitch Cycles mean that in 12000 years northern hemisphere’s midsummer will be in December? This means spring should start 45 minutes earlier (or later) every year. Is this being factored into the results? Do any of the other natural cycles come into play here? Here in Stone Mountain, Georgia, USA the daffodils are yet to bloom. Last year I sent out an obnoxious e-mail to my Yankee friends announcing their bloom on February 11th. I think they normally bloom in about the third week of the month (I’ve lived here 23 plus years). No doubt next year they will bloom in February again and we will be told that it is because of Global Warming. PS: We don’t really expect much snow accumulation tomorrow. Hey, those flowers are lit from the wrong side. You can even see shadows where there is nothing between the pictured Sun and the shadow. Look Daddy! The deniers are making stuff up again, just like my teacher said they do! Mr. Gore would never lie like that. He has a Nobel Prize, that means you can trust him! Here in beautiful, subtropical Eugene, Oregon, my daffodils are producing quite nicely, as are the forsythia and flowering plum trees all over town. We’ve had a nice, mild, El Niño winter, I think. Well, it’s been mild, at least. All of which proves something. Or doesn’t. With a high degree of certainty. I am glad its not only me who has a problem with the completely witless tosh that is written by Louise Gray in the DT. On BBC tv they had David Shuckman, another disciple of AGW, standing in a filed of crocuses saying how the report had said how early spring had become when we all know that it is late this year because it has been COLD. How can he be so ignorant? How can his production team be so useless? No mention was made of the the study period having ended in 2005. God save us from this awful journalism! Here in south Alabama I have been trotting my wife’s flowers in and out of the house all month to keep them from freezing. Also covering and un- covering some outside ones. My back hurts. Darn global warming causing all this cold. I’m writing a letter. Intellicast is saying that Spring weather (showers included) will arrive here in Wichita in about 5 days according to their forecast, a welcome relief from the last two years where despite February being a bit warmer, Spring arrived late. Our daffodils are now growing and the fact we’ll have lows in the 40’s later this week will give them the all clear to finish growing and bloom. El Modoki seems to be under siege from colder than average waters just to the north and south from the ENSO region not to mention the growing and cooling area off of South America. OK – have to admit that this year on the left coast of canada, we are having a beautiful GW spring. But here is the wierd thing, my pear tree is starting to bloom about 4 weeks early, yet my apple is just starting to puff out its’ flower buds, about right. But the weirdest of all is the cherry tree, still no sign of life in its’ buds! The cherry is a June producer, so it should be and usually is, first to bloom. Not this year. UK Warmists started referring to a “cold snap” back in December when Boreal cold descended on Blighty to stay. Webster’s New World College Dictionary says a cold snap is: “a sudden, brief spell of cold weather.” Nothing brief about this. Beware of anyone who uses words this way. They intend to do evil. >>Repeat a LIE, loud enough…long enough…eventually most people will believe it is the truth. The source is for the quote you paraphrased is Joseph Goebbels, Hitler’s master of propaganda. In general, storms represent a tremendous amount of energy being released from both the oceans and the atmosphere, thus storms=energy release. So for example, the last glacial period saw cooler temps and drier weather overall. So, if AGW is an accurate model, then we would expect to see bigger and bigger storms and more severe weather in general. Also, Feb. 2010 looks like it may just miss (or just make) being the warmest globally in the troposphere on record…following closely on the heals of January 2010’s record temps. I know it’s all interesting reporting on the weather in our own back yard, but climate change is about what’s going on globally…and it’s been a very warm and stormy past few months, southern and northern hemispheres (when looked at from a global perspective). According to the BBC, England has just had its coldest winter in 31 years whilst Scotland and Northern Ireland has had their coldest since 1962/63, which in itself is the third coldest in the entire 350 year CET record. So it looks as if natural variabilty can counter 50 ppm CO2 increase since the late 1970’s for England whilst natural variability in Scotland is able to counter an even more impressive 65 ppm increase since 1962/3. So either natural variability is much greater than had previously been admitted, or perhaps Co2 is not as powerful a climate driver as is believed? Looking at the huge variations in temperature throughout the CET record with temperatures as warm as today despite CO2 at only 280ppm, perhaps we need to re evaluate the relative potency of CO2? Love reading those alarmist articles – wording is quite entertaining – lot of “may, can, are believed, suggests, can, growing concern, growing evidence suggests”. Pretty clever – not making any hard claims, but trying hard to appear to be credible to the gullible masses. Accuweather has our weather up to average for 4 days out of the first 15 of this month…looks like most days will be 10f below normal with more snow than rain. I want spring…tired of this cold weather. Phil Jones said there hasn’t been any significant warming for 15 years. It isn’t one late spring. Global satellite-measured temperatures matter (since surface readings are so easily jiggered). 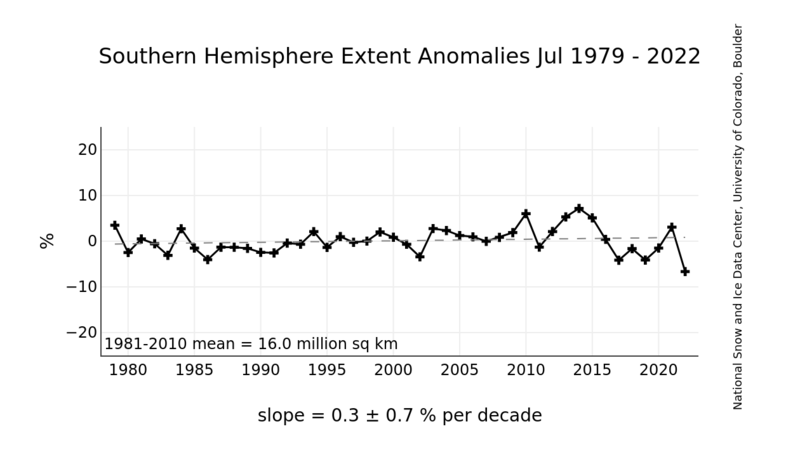 Global sea ice extent matters (again, satellites). Global sea level matters (again, satellites). Note the word “Global”. The regional anecdotes, as in the above article, are indicative of nothing. 30 years of failed alarmist predictions. I’m still waiting for the seas to rise any faster than they have since the 1800s. Union of Concerned Scientists Committed to an “open-minded search for truth,” and armed with “unrivaled scientific expertise,” the Union of Concerned Scientists (UCS) “doesn’t say anything [it] can’t back up with solid evidence.” At least, that’s what its fund-raising letters say. The reality is quite different. UCS embraces an environmental agenda that often stands at odds with the “rigorous scientific analysis” it claims to employ. A radical green wolf in sheep’s clothing, UCS tries to distinguish itself from the Greenpeaces of the world by convincing the media that its recommendations reflect a consensus among the scientific community. And that’s what makes it so dangerous. Whether it’s energy policy or agricultural issues, UCS’s “experts” are routinely given a free pass from newspaper reporters and television producers when they claim that mainstream science endorses their radical agenda. Many other activist groups, Foundations and individuals are profiled for your perusal. For the past few years, we have had earlier springs and milder winters. Did I appreciate it, no. I’m sick and tired of this winter, I’ll tell you that. I’ve learned my lesson. I will never complain about warm weather again! Let’s take a look at a scenario that might be a more powerful argument IF it had occurred (but it didn’t). Suppose for example that the entire N. Hemisphere, including the arctic, had experienced a severe winter, and we saw the arctic sea ice extent go way into a positive anomaly range, and we saw this lead into a very cool summer, and then the next winter saw the same thing, and so on. But that’s not what has occurred this winter. We had a very negative AO, which brought down cold air further south than normal, but we had WARMER arctic temps over much of the area, especially Greenland, and this was all related to the same set of dynamics. The arctic sea ice extent has not shown a positive anomaly since 2004…and it remain in a negative anomaly this winter. The severe winter in SOME areas of the N. Hemisphere has been related directly to El Nino, and the negative AO which forced colder air further south and combined with El Nino moisture…but globally speaking, the troposphere has now been in record warmth territory since the beginning of the year, and NOT coincidentally, we’ve had big storms all over the globe. As you point out, that is due to prevailing wind patterns not temperatures per se. The heaviest single storm snow fall in Denver was in December 1913. Our Christmas blizzard of 1982 on Christmas Eve was also one of our all time heaviest snow falls from a single storm, and due to a strong low setting up over Springfield Colorado in the extreme south east corner of the state pulling abundant gulf moisture up into the Denver basin. The moisture is there all the time, it just needs the right wind patterns to bring it into contact with cold outbreaks. On the possible cooling trend the Heating Degree Day numbers here in Colorado clearly show that the last 2 winter seasons were below average temperature. So far this winter season we are +318 HDD over normal, and last year we were +432 HDD. Last summer season was down on Cooling Degree Days as well being 163 CDD below average. In many other years Nov, Dec and Jan came in second to the spring months by only very small margins. Snow fall depths have very little to do with temperatures but depend very strongly on wind direction. Especially here in Colorado where much of our snow is due to orographic lift. Can’t grow Daffofils in Brisbane. Therefore we have no Spring. Therefore the Planet has already warmed too much. We’re all going to die. Little Katie’s teacher, however, is on the verge of having to accept she has spent 10+ years needlessly frightening her young charges in ever more strident terms, which is especially egregious considering the numerous studies and reports of how global warming alarmism has so afflicted our children with depression and hopelessness that psychiatric therapy and drugs are employed for treatment. Indeed, she has been an accessory to essentially terrorism, a deliberate attempt to incite fear and panic to bring about changes in political and public sentiment. I think we should leave her twisting in the wind, and give her nothing she can warp into justifying the willful continuing of the fear-inflicting process. Perhaps you can add a little note below the photo about its source “just in case” so it’s labeled as not being from WUWT? Besides, it’s only been what, not even a week, since that “OMG It’s Photoshopped!” uproar with that airport weather station post. So I applied the popular “Precautionary Principle” and launched a preemptive strike. And see how well it worked to address what might not be a non-issue! I strongly suspect against possible AGW complications, applying the PP shall work as well. Thank you for pointing out all the reasons that CO2 is not the cause of natural climate variability. A bare couple inches at the side of the road, where the accumulated salt of winter has depressed the melting point of water does not a spring make. One single storm (such as the rather freakish blizzard of 1982) doesn’t tell the story, as you know. That storm of 1982 got it’s energy from the El Nino warmth off the pacific. If you remember, the storm was tracked for days as it came in off the pacific, over Californina, and finally set up in Colorado. True, the low pressure system, once it crossed the Rockies, may have set itself up in SE Colorado once in the state, but the energy for that storm was warmth from the pacific. In regards to wind direction and storms, you are of course correct. For upslope storms to set up, since the circulation is counter-clockwise around Low pressure in the N. Hemisphere, then it takes the right set of circumstances to create that circulation around the low that will pull moisture up from the gulf coast to drop on Colorado. Sure, we can get big snow storms any month of the year, but historically, we gotten the most snow in March, and if you want to claim that it has to do with the wind direction, we know that wind in generally is a heat-energy related atmospheric phenomenon, ulitmately caused by thermal differences in the atmoshpere. Those thermal differences set up circulation and pressure grandients which ultimately cause wind. Heat or thermal energy is the power behind all storms, and we’ve got more of it available in March, and thus, we get the most snow (on average) in Denver in March. But regarding wind, heat doesn’t explain it all. There’s also the coriolis force. This is all very interesting but most of you are missing the point. There is only one reason that we have the seasons that we have now and that is because of the tilt of the Earth’s axis in relation to its’ orbital path. The key dates in the year are the equinoxes and solstices. Since astronomers have been determining those dates those of us who use the Greco/Babylonian system have started the seasons on those dates. The Cino/Celtic system starts the seasons inbetween those dates. In our modern calendar and system beliefs we have people referring to both systems at once, e.g. the northern winter solstice, the first day of winter in the northern hemisphere, is often referred to as ‘mid-winter’s day,’ (from the Celts). The fact that our calendar isn’t aligned to the seasons as it once may have done, during the early Roman republic period e.g., just adds to the confusion. Using the blooming of flowers such as daffodills is frought with the problems outlined above, i.e. the large variance of such events. Like many of you I have been interested in monitoring the arrival of the daffodills around my home over the past 23 southern hemisphere winters. On only one occasion, 1988, have the daff’s popped up before the end of July. Normally they pop out towards the end of the first week in August (you northerners just think February) and the latest being August 13th. It is obvious to me that the plants are reacting to the weather/climate around them to trigger the sprouting season off. Augusts in my part of New Zealand have been very mild for the past five years, sometimes enjoying more sunshine than any of the three following months! Despite this the daff’s never arrive outside that two week period at the beginning of August. This is the middle of winter in the S.H., hardly the start of spring. My point on all of this is that we can talk about ‘spring-like conditions,’ or ‘winter-like conditions,’ but spring for the northern hemisphere occurs when the sun crosses the equator heading from south to north at around 18.00 hrs U.T.C. on March 20th. End of story. Anything else is a moot point. To which fan are you referring;the one to the West of town or one of the three to the East? Plants (and crops) Don’t Lie. They’ve had millions of generations to perfect their sensory systems, whereas we’ve had barely 30 years of satellite obs to dicker around with – scarcely 3 solar cycles. Denver metro area highways and side streets are getting more than their share of dead skunks lately. I would attach a percentage representing the anomaly for this, but it just doesn’t seem proper to make those numbers up for such a respectable site as WUWT. The smell of course lingers for days, even after the corpses have been removed, provide small roadside eulogies to all the places where traffic and skunk have collided. If spraying is part of the skunk’s offensive package, you have to wonder if Mother Nature might put a little more work into its “flight” response to trouble. Great Horned Owls, for example, don’t eschew skunk for a meal, since they has practially no sense of smell. FWIW, I sure don’t remember them in this great abundance (4-5 in the last month of normal driving), but Wiki informes me that Mephitis mephitis (striped skunk) typically mates in early spring, gives birth in May, and has a gestation period of about 66 days, so I guess these lingering roadside memorials are being create about on schedule (as they emerge from their dens for to mate. Obviously , it’s a rude awakening to find an SUV bearing down on you when all you wanted was… well, you know. Apparently the US has had the first February in over 60 years without a single reported tornado. Denver metro area highways and side streets are getting more than their share of dead skunks lately. Mann-made global warming has caused a new population of climate scientists to proliferate in the Colorado region and the skunks’ natural range. Since only one population of skunks can predominate at a time in the same territorial range, the little guys are losing their lives in the exodus. Excellent post. Indeed, in PAST warmings, something seemed to cause the CO2 to rise over a long period of time, 800 years or more, and then the CO2 warming adds to the warming as a positive feedback loop. But humans have caused CO2 to explode upward (from a historical perspective), and so THE central issue is whether humans have taken the place of whatever this natural cycle in the past was that increased CO2, and have now increased CO2 so rapidly that the positive feedback loop that CO2 (and Methane as well) gets going much quicker and more strongly than the 800 years or so lag that we saw in the historic records. Climate scientists are not disputing this lag…but the lag is not the issue…the issue is how quickly we’ve increased CO2, how quickly this positive feedback loop might get going and how strong it might be. I’m not a warmer. As for comment two, I fell I can co-exist quite nicely with the dendrochronologists – and others in the same range. From here in central Pennsylvania I use the Possum Indicator. It’s less than a five minute drive from here to town, from less than a minute out it’s a winding hillside road with woods on both sides. When there are two same-day or three still-fresh remnants, as found more than twice in the same week, the coming of Spring is signaled. Next day, early in the morning, I found a dead possum out in front of the house, middle of the road. Looked to have been squashed right there. I have not counted that as two same-day due to the locations, and because I suspect God pulled a prank on me as a mild reproof. Otherwise, nothing lately, no Spring coming. Oh, there are also some bulb-based flowers next to the block foundation alongside the house, the South-facing end, that have reliably come up slightly early, even through snow. Irises I think. No sign of them yet. However they were next to the old masonry chimney, which I had to knock down when I discovered it was too leaky. The new one I put up is double-walled insulated stainless that stays so cool to the touch that icicles have been noted hanging off the lower edge of the rain cap. Thus that “flower indicator” will need a few years for the recalibration check before further use. Have we run low on trailer parks? It’s well known you rarely can have a tornado without a trailer park nearby to generate it. Check the statistics based on the TV news reports. Nearly every time, first comes the trailer park, then comes the tornado. The remainder has been attributed to modular homes, as it is suspected due to the similarities that modular homes may also generate tornadoes. That, my friend, is gross. When the milk of human kindness was being meted out, did you claim lactose intollerance? It was about 90 deg these past 2 days in Taipei after an especially cold winter. Despite the lull in warming over the past 10 years, there is little doubt we have been in a warming trend for the last 35 years. That may very well reverse and we will have another 30 year cycle of a cooling trend. We should know in another 5-10 years (if we can trust the data, which is doubtful). I think you can safely conclude that the global satellite record shows warming of about 0.18°C per decade, just as the climate scientists have been saying for many years. I’m not sure we’re on the same page here, the assertion that CO2 caused *any* additional warming during the natural variations demonstrated in the ice cores is an unproven theory/assumption. Something unknown started the warming in question for however many years and then just handed the warming off to CO2? They’re taking an A-then-B-then-C correlation and use it to posit a B-then-C causation. I’m sorry but that seems to me to be the cart before the horse, and while I’m not one to call anything impossible… it does qualify, IMO, as an extraordinary claim that should be subject to extraordinary proof. “Take our word on it” for something as counterintuitive as that is not acceptable. I’m pretty sure the barbapapas are going to be mighty peed off because they didn’t have to leave the planet. I’ll be glad when they return from planet B. Our daffodils just came out, NW Ca. It has been the same cloudy, rainy w/rare sunny day since 2nd week of December. We have someone who writes from Innis Falls, Australia, speaking of an early winter. More info requested. In other news, while the daffodils are not signaling a Northern Hemisphere springtime, it has been raining fish in Australia. What season is signaled down under by the falling of the fishes? Pure nonsense. The human contribution of carbon dioxide to the atmosphere is such a small percentage of an already miniscule percentage of the gaseous atmosphere, it is on the very edge of instrumental detectability. The human contribution is small enough to be smaller than the error ranges for the instruments used to measure it. The Earth is experiencing an extreme scarcity of carbon dioxide in the atmosphere only very very seldom seen before in the past 550 million years in which vertebrate life forms have existed. Didn’t think you were a warmer, to good a sense of humor. I don’t know about the dendochronologists, though. Steve McIntyre seems to have a broader territorial range extending all the way from Starbucks to the ridgecrests. How about you. Run across any of the two legged skunks in the High Country lately? North Central NC – 03/01/2010. It has not been uncommon over the last 25 years I’ve lived here to see the Bradford (ornamental) pair trees blooming by the first week of March and the grass starting to green. Not this year… not even close. Temperatures are forecast below freezing for most of the next week. Normal min. temps are 34F. Feb. probably ran about 5F below normal. There were only 2-3 day during the entire month that reached or exceeded the historical average. I’m somewhere between amused and disgusted by groups like the Union of Alarmist Scientist. Isn’t it interesting that they can’t provide a citation for a study that’s less than a decade old? Isn’t it ironic that the “deniers” are the ones spouting “misinformation”? We may indeed be talking two different things. I certainly get your point I think– that is, who can say what real proportion of warming is caused by CO2 versus whatever started the warming to begin with. How do we know that 1/2 to 5/6 of the warming was caused by the CO2. Here is where the rubber meets the road, for if you study the ice cores specifically, down to the very little variations, you see that yes, a period of warming might have preceeded a rise in CO2, but then (after the first 800 years or so) the little variations in the temperature usually (more than half the time, and some say up to 5/6 the time) follow a rise in CO2. It is as though something kick-starts the warming, but then the CO2 levels, perhaps through positive feedback loops, drive the rest of it. So again, the central issue is whether or we humans have given this CO2 positive feeback warming cycle the boost it needed to get going or not. We know that CO2 cause the initial warming, but we know for certain (based on solid science) that CO2 can indeed keep a positive-feedback warming cycle going. Humans have given a huge potential boost to CO2 levels, and the “warmists” would say this has been enough to get us into a warming cycle. Now methane doesn’t stay in the atmosphere very long before breaking down, but it is 22 times or so more powerful of a greenhouse forcing gas than CO2 and it would make one hell of a trigger to start some ancient warming cycles…and then once it was gone, the raised CO2 levels would perpetuate the warming. Finally, it is interesting to note that methane levels are currently rising in the atmosphere and the melting of permafrost seems to be at least one of the culprits, though the jury is still out. … spring for the northern hemisphere occurs when the sun crosses the equator heading from south to north at around 18.00 hrs U.T.C. on March 20th. End of story. Anything else is a moot point. Except to meteorologists. “Meteorological spring” runs from March through May. “Almost exactly” – WTH does that even mean?! NOTE: This is not the dreaded “hockeystick” chart…but only looks like it. The data on this chart are not in dispute, and they come from ice core samples, and have been taking from multiple sites in multiple locations by multiple scientists. Yes indeed, relative to the past 800,000 thousand years, CO2 levels have exploded upward since the industrial revolution…and human activity is most certainly the cause. I have to laugh at all the gardening magazines that have been telling people over the past years that the temperature zones have been moving north. Encouraging people to plant plants that are way too tender for their “real” zones. I’ll bet a lot of people got royally burned in their gardens this year. Would you say that we have been lucky? or very unlucky? If C02 were to drive the climate AFTER it was kick started, why didn’t it drive it BEFORE it got kick started? Because the predominant greenhouse gas on Earth is water vapor, and as the temp drops, so does the evaporation. And for all those times when C02 really was single-digit percentage, while the temp of Earth was dropping into Ice Age levels, the C02 was lagging behind but still couldn’t hold up it’s end of the bargain. This is a job for a new whizbang petaflop computer modeled climate driver. * Early Warning Signs of Global Warming: Climate Research Unit dies. Overdose of CO2 suspected. Actually, many people are killed each year attempting to avoid small animals that venture out on the road. I happen to drive a bit in the Nevada desert from time to time and the first thing the cops will tell you is DO NOT attempt to avoid jackrabbits and other small animals. The shoulders of the road are soft, if you go off, you can flip. Or that person behind you might not see the animal and your panic braking might cause an accident. Seriously, never attempt to avoid a small animal in the road unless you have plenty of time to slow down. Most of those studies end in the late nineties or in 2000. DUH!!!!!! Wait five years and then see if spring is really coming earlier. Out in the Skagit Valley in Western Washington, they’re all up in arms that the daffodils and tulips will come too early. Last year at this time it was still very cold, and they were up in arms because the flowers were late. You’d think these people had never had to deal with delays or early blooms. WINTER 2009/2010 (Weather & climate statistics define “winter” as the months of DEC. JAN. & FEB ) . Those born locally, during or after the Spring of 1963, have just experienced the coldest winter of their lifetimes. In many parts of the U.K.,however, the winter of 1978/79, was marginally colder. The figures below summarize the situation for Pitlochry, featuring the 2 coldest winters since 62/63, as well as the 30yr average. The figures given are the monthly mean max. & min. together with the mean winter temperature. The figures indicate that this past winter has experienced a negative anomaly in average temperature of almost 3 degrees. Over the past 20 years or so, there has been a succession of mild or very mild winters. Negative anomalies in ANY month have been the exception, so encountering 3 on the trot so much below normal is quite a shock to the system!! The jet stream, which plays a major part in steering Atlantic depressions over & to the north of Britain, giving mild, unsettled conditions has, on this occasion, been displaced some distance to the south. The result for Britain has been that mild westerlies have been replaced by airstreams from the Arctic & the cold continent. The severest of the winter weather occurred during the period 18th Dec. to 10th Jan .& during Feb. the town has largely escaped the worst of the snowfalls which have plagued parts of Highland, Moray & Aberdeenshire. There was, however, a spell of sharp frosts between the 16th & 24th, during which a new February minimum of -12.6 was recorded. The immediate outlook is for cold weather to continue, but meteorologically anyway, Spring has now begun, no matter how determined winter may be to hang on ! PITLOCHRY TODAY— Frosty at first, but a dry day ahead with long sunny periods. Wind moderate from the NNW & max temp. still a couple of degrees below normal at 5. TONIGHT—Clear periods with a sharp frost, down to around -7. CO2 does not TRAP heat. If it has any effect at all, it slows the release of kinetic energy to outer space. If it trapped heat, this planet would have turned into a desolate rock eons ago! Can we not be more precise in our terminology at least? Sorry NickB, forgot the smiley face! The ‘Meteorological Seasons,’ have now become the officially sanctioned seasons of our govt. in N.Z. Using Dec, March, June etc to start the seasons is out of step with the reality here in New Zealand. March is often hotter and drier than December in most years, but March has been cosigned to autumn when 3 weeks out of the four are before the equinox. Expediency. No wonder our politicians went for it. They know all about expediency. It’s because they are not just anybody. The Skagit Valley commercial growers boast how they sell more tulip bulbs to Denmark than Holland does. The Skagit Valley Tulip Festival is held each year as an international tourist event while thousands of acres of narcissus and tulipa are in blossom. Thousands of tourists arrive from all over the world to see the fields of flowers and participate in the festival events. Consequently, there is a lot of money at stake when the festival officials schedule the events to satisfy the tourists and commercial buyers who are coming to see the fields of flowers in blossom. Unfortunately, the warming weather during the 1990s kept pushing the week of peak blossoming out of its traditional event dates to earlier and earlier weeks. Then the trend swung the other direction and pushed the week of peak blossoming ever later in the month and across an entire month as the weather got colder and colder. during the most recent ten years. Festival officials have become more and more defensive about their scheduling problems, and they finally began to lengthen the Festival schedule so there would be at least some part of the fields blossoming more or less during at least some part of the new month long festival schedule. During the 1990s, the weather was warm enough for the rosemary and some other tender plants to survive and prosper in the Skagit Valley and Fidalgo Island area. Tomatoes hybridized for the short, cold, and difficult growing seasons of the pacific Northwest actually ripened into nice red tomatoes by September. During the 2000s, however, the tomatoes just sulked and were still green on the vine in September, refusing to ripen into red tomatoes on the vine or even curling up and dying from disease in the cold and wet weather in summers with few warm and dry days. Likewise with many of the flowers, the summers returned to the cold and wet conditions last seen in the 1960s and 1970s. As NOAA repeatedly trumpeted unprecedented warm weather and warm climate in Western Washington, the plants were having nothing to do with it, blossoming a month later than the 1990s and sometimes refusing to ripen and blossom at all. The rosemary plants thriving in the warmth of the 1990s have been nearly wiped out by deadly freezing weather in January to April 2007-2009. Then the winter of 2009-2010 really confuses the plants in the Skagit Valley and Fidalgo Island. The weather was so warm in December and January the trees began to bud and blossom in the false Spring weather. The crocus and Iris danfordiae blossomed early. You have to cringe as you wait for another of those killer frosts to show up in March as an ugly reminder that the warm weather is a fluke of Nature. Meanwhile in Illinois, Missouri, Indiana, Kentucky, and Tennessee, the garden plants are being hammered by the recently and increasingly cold winters. All across the Great Plains the winters in the 2000s have seen motorists being stranded on the Interstate highways by severe winter weather, snowfall, and blizzards. In some places there has been snow on the ground from mid-December through February with the exception of maybe only three or four days. This much snow and this much persistance of snow cover on the ground is some of the worst seen since the 1960s and 1970s. The cold weather conditions have even been killing some of the native plants. Farther south in the warmth of Southern California, it used to be necessary to where a modestly warm coat or jacket in the winters of the 1960s and 1970s. The air conditioner was in use only in the months of June, July, August, and sometimes in early September. Beginning in about 1979-1980 this all began to change. The coats and jackets stayed in the closet and were never used in Southern California for many years, because it just wasn’t cold enough to wear them anywhere at anytime except in the mountains or out of state. By 1985-1998 the air conditioner was in constant daily use from about Fbruary or March through October or November. Even then, there were days in December which required the use of the air conditioner to keep room temperatures in the high 70s. By 2002, however, the coats and jackets came out of the closets and the air conditioners were no longer necessary nearly year round. The garden plants are not always so ready to bud so early as in the 1990s in Southern California. You certainly are proving yourself to be a sucker for AGW false propaganda and disinformation. The Wikipedia articles are authored by some of the worst false propagandists supporting the AGW mythology. The chart is a classic example of the cherrypicking of information and torturing it to misrepresent results. It is a “great chart” only for those who seek to perpetuate bald faced lies to the public. For the past 800,000 years or so, CO2 had not exceeded about 300 ppm and averaged about 220. First, the numbers and dates are wrong. Mauna Loa Observatory claims to have measured 317ppm as late as 1959, and I don’t necessarily trust Mauna Loa’s results for a multitude of reasons including their advocacy of AGW long before they began making the measurements to bolster their advocacy. The bulk of the antrhopogenic carbon dioxide releases can only have occurred from about 1940 to the present based upon the world populations and industrial activities. Yet earlier measurements of atmospheric carbon dioxide reported higher than 300ppm levels before 1940 and before 1900. Even if you could blindly and uncritically accept the results of the founders of the AGW advocacy movement at the Mauna Loa Observatory, you still have the problem of the carbon dioxide rate of increase beginning a half-century to one century before humans were populous and industrious enough to have released the carbon dioxide after 1940-1960. The increases in atmospheric dioxide correlate to the natural emergence of the planet from ice age conditions, but they fail to correlate to human activities which occurred 50-100 years after the chnages in carbon dioxide and receding glaciers were already well and truly underway. The data on this chart are not in dispute, and they come from ice core samples, and have been taking from multiple sites in multiple locations by multiple scientists. Maybe the data is not in dispute in the fantasyland you live in under some rock with the laughingstock AGW proponents like Al Gore and others, but there is great dispute from geologists, meteorologists, and others not participating in the great climate hoax and fraud. The data being used is from a mere handful of ice cores using methods and hotly disputed claims of accuracy which put even the dendrochronologists and their treemometers to shame. The same type of refrain and excuse enunciated by Joseph Goebbels, Minister of Propaganda for the Third Reich, is being used to defend the HCN surface weather observation air temperature datasets used by HADCRU, NOAA, and NASA-GISS; and we can all see how badly that fraudulent enterprise has fared. You cannot use the excuse of consensus to cheat science forever, because much sooner or sometime later you will be found out by anyone willing to adhere to real scientific methods, whether or not they are in a minority of a fashionable opinion. There you go again with the illogical and unscientific “correlation is causation” assumption and argument. Even then, you argument still fails because most of the glaciers in Glacier National Park were melting away long before the industrial age had begun, and the high rate of increase in CO2 had already begun when the first electric light bulb and electrical generators were invented. We are presently living in the Quatenary Ice Age that begun about 30 million years ago and an inter-glacial period which began about 12,000 years ago. Given the fact the Glacial periods of an ice age result in extremely suppressed levels of atmospheric carbon dioxide and we are in the early stages of an inter-glacial warming period, it is to be expected and perfectly natural to find a rapid increase of atmospheric carbon dioxide in response to the temporary retreat of the conditions of a glacial period with or without the presence of humans and human activities. You simply cannot warm the planet naturally without also increasing atmospheric carbon dioxide or cool the planet without reducing atmospheric carbon dioxide. Furthermore, the carbon isotope in a molecule of carbon dioxide provides some indication of its source from biological or non-biological origins. The proportion of these carbon isotopes which can be traced to human activities is another hotly disputed subject, but it remains such a small percentage of the planetary atmospheric carbon dioxide as to be on the limits of measurability by our instruments. When comparing the amount of carbon dioxide remaining in the known reserves of fossil fuels, humans are physically incapable of increasing its percentage contribution to the total planetary atmospheric carbon dioxide, even if you could somehow magically burn all of those reserves in only one lifetime or one year of a lifetime. Even if humans could burn such a vast store of the fossil fuels to generate a significant multi-gigatons increase in its percentage of contribution of CO2, it would have little further effect as the levels increased, because the effect is diminished the more you increase the quantities. In other words, you are spouting [snip]. hahahahahahahahahahahahahahahahaha wow spring coming earlier! all the trees down here in texas should have leaves starting to push out, and the did until the snow last week killed them. I wonder what summer will look like now. I hope the trees regenerate because it will be one ugly hell hole without leaves on trees. TonyB (11:39:20) : So either natural variability is much greater than had previously been admitted, or perhaps Co2 is not as powerful a climate driver as is believed? I agree with your perspective, and appreciate your historical perspective contributions here. A third alternative is that the natural variation in CO2 is much greater than we have been led to believe, and has a mild effect on climate. No, you’re to hope and pray that earlier springs stay and even occur earlier. Longer growing seasons mean more agricultural production, increased forest growth, etc. There isn’t much wheat grown in Canada under a glacier! The only evidence being your interpretation of ice cores? I say no, we don’t know whether CO2 can keep a positive-feedback warming cycle going, there is no solid science that proves it. How do you falsify my statement? I don’t want a flame war, R. Gates, i just want to know with which evidence you would falsify my statement. Yup. As I was told way back in high school driving class, apologies to Disney, if it is you or Thumper then it’s Thumper. Swerving to avoid can be much worse than the impact. Had no place to go anyway, high sidewalk curb on left, parked cars on the right. And with a pick-up truck you have ground clearance, the critter might be just fine between the wheels, and trucks are not known for doing fast braking nor fancy avoidance maneuvers. My experience, roughly half the time they are fine, might get whacked and dazed but they’ll walk away in a bit. When I said “I was driving a truck” that’s what I was referring to, as I made that split-second decision. And, as experience has shown, braking would likely have been worse for the critter as I didn’t have time to fully stop. It was moving and I saw it’d be centered. Slowing down would’ve increased the odds the right wheels would have gotten it. I don’t kill critters for fun. When I lived in town I did a live capture of a possum that was hanging around my back porch when I was putting food out for stray cats, released it out here “in the wilderness.” However, I have personally put down suffering animals, including a much-loved dog we had for over 12 years. It’s tough, but there are times when it needs to be done, and waiting for a vet to do it for you just means it will suffer longer. There is something that some people just have problems accepting, you have to make distinctions. As a practical matter. Cats and dogs can readily be pets. I have taken in numerous cats over the years. But possums are not pets. You don’t expect to find them at petting zoos. In an urban setting they are just very large rats, with very sharp teeth. You don’t want them around kids and pets. That possum I caught, in that situation I was able to remove it to a natural habitat, to remove a potential threat to my fellow humans without killing, and I did so. Behind the wheel that night, knowing what it was, knowing it had a good chance of surviving anyway… Didn’t have the time to second-guess then, don’t see the need to do so now. Granted…the intensity of this feedback is still under debate…but the fact of a positive feedback loop is no longer. Also, integral to this loop is methane, which is rising as well in the troposphere, and could provide a key component in future positive feedback intensity. Ugh. There ain’t nothing blooming here. I don’t believe it’s gotten above 37F all day. We had a few days where the high was near or above 50F, but the lows were always in the 20’s. I live in Arkansas and that’s “The South.” I’m not touching my garden until we pull out of the 20’s. Sure, I’m still dumping organics onto my compost, along with the winter ashes of course. But the only sprouting going on here is in Mason jars in the cupboard! Please, oh, please! Let there be some global warming! Let it come earlier and earlier! I’m tired of being cold. I want my herb garden back. I want fresh tomatoes. I want to hear the “snap!” of snappin’ beans, sittin’ on the back deck with a paper sack between my knees. Flowers is nice, but veggies is more nicer. Y’all pray for warmer weather. I’ve run out of wood. Observations from an occasional gardener. I live in Selsey, West Sussex and last night, 1-2 March 2010, gave us a very heavy frost. It is now 8:45pm in the evening of 2nd March and already the frost has made my grey car white. It is bitterly cold outside right now. The snowdrops have only just started to open and of the daffoldils there is still no sign. My Autumn-planted broad beans have failed completely, killed when the ground froze to the depth of their roots. The early potatoes which I had in the greenhouse to chit I have had to bring indoors to escape being nipped by the frost which would expose them to rot. I have shifted my entire gardening plan 30 days more towards what promises to be a subdued Summer. My plans of growing physallis and tomatoes in the greenhouse have been abandoned; I shall stick to growing brassicas and root crops this year. and see where it is!! Do you even know or understand what “feedback” is and what its relationship is to the climate? Where is your alarm and concern for the other even more potent “feedback” culprits such as uncontrolled emissions of dihydrogen monoxide? The MSM in the UK really have no understanding of how irrelevant they have become to the CAGW debate. The more they hype their warmist alarmist agenda as the Earth cools the less their intended audience believes in this fraud. CAGW is dead here in the UK, and the MSM are not even trying to give it a decent burial. Just waiting to see how long it will be before they start the ‘ice-age is coming’ scam. I am in central North Carolina USA. In the 15 years I have lived here I have seen snow four times…. until this winter. It has snowed five times and I am now looking at over two inches of the white stuff. Last spring and summer was noticeably cooler too.